Wow - what an amazingly fresh take on Ravel's piano music! (...) No matter whose previous recording of some of these works you may have in your collection, Barto's will in no way be a duplication! Rarely do you hear a rendition of Ravel's piano music which is so subtle and differentiated in terms of sound, so radically poetic and stunningly virtuoso at the same time. Tzimon Barto is a pianist who (...) does not think of music as an ivory tower. That can be clearly heard on his new recording (...)- a journey between Being and Seeming, reality and veracity. That's how impressionism should sound like. Not lost in thought, but perspicacious. Tzimon Barto's two albums (this included) show exactly how magic can happen - namely by penetrating the intellectual and superficial shell of the music and by catering to its individual requirements and demands. Barto sweeps and flickers through the highly virtuoso vicissitudes (of Scarbo) as if in a state of conscious delirium. We experience a daring venture amidst the spirit world of the Pyrenees, a radically new approach to the often-played (...) piano hurdle. (...) In terms of finesse, transparency and acoustic fluidity, this reading (of Alborada del gracioso) which explores the very deepest nuances of the score, can hardly be surpassed. 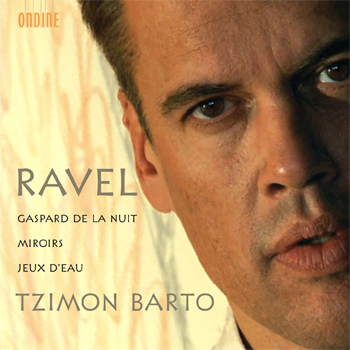 This CD features pianist Tzimon Barto with a selection of the great piano works by Maurice Ravel. Tzimon Barto is known for his refreshing approach to known repertoire, as well as his broad range of tonal colour, qualities tailor-made for the piano music of Ravel. Barto's musical maturity, superb technique, and endless colour palette have made him one of the most radiant and unique personalities in the music world. This disc follows on the enthusiastic press and success of Tzimon Barto's début on Ondine - featuring keyboard pieces by Rameau (ODE 1067-2). The booklet includes liner notes by Ravel expert Étienne Rousseau-Plotto (author of the biography: Ravel. Portraits basques, Anglet: Séguier 2004) who also contributed with rare photographs of Ravel and historic illustrations from his private collection.